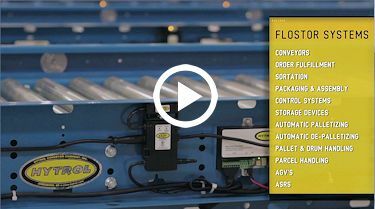 FloStor develops implements and supports award-winning automation solutions for inventory, distribution, fulfillment, and manufacturing systems. FloStor Systems Sales Engineers review your current processes in light of productivity goals, forecasted demand, product development, and capital budget. This collaborative evaluation generates the concept and design criteria for incremental system improvements or a comprehensive new system. With over 80 years of combined experience in material flow, storage systems, and robotics, our Design Engineers work in conjunction with System Sales Engineers and your managers to transform the concept to working drawings. The Design Engineering Department uses contemporary technology, including AutoCAD and specialized materials handling drafting software. Cloud-based file sharing and electronic drawing mark-up enhance collaboration and expedite the design process. All systems are designed to the strict structural and seismic requirements of the 2010 IBC/CBC. FloStor maintains a complete metals and machine Fabrication Center staffed with millwright professionals. Critical components of your system are erected and tested prior to installation to insure there are no surprises and delays at your site, on your time. 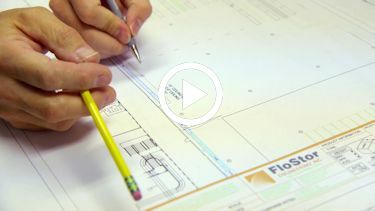 When the best solution to fulfill your requirements has not been invented, FloStor builds it. Our skilled and specialized Project Managers work in collaboration with your managers to insure systems are completed on time and without disruption. The Project Managers oversee a crew of millwright professionals with a longstanding association with FloStor. The comprehensive Zero Injuries safety program implemented by FloStor is designed to meet the specific requirements for the installation of materials handling systems, and has achieved awards for working free of accident and injury. Your key operations managers and facilities personnel are provided comprehensive training in the operation and maintenance of the system and in safe operating practices. FloStor furnishes documentation unique to your system, including an overall systems operations manual, maintenance manuals for all major mechanical components, and comprehensive software documentation. FloStor systems are over-engineered for trouble-free operation in harsh and demanding industrial conditions. The optional Preventative Maintenance Program is available to ensure continued operations. Scheduled maintenance is performed by our specialized staff. In addition, our mechanical, electrical, and software specialists are available 24/7 to address emergencies. Our customers say it best..
FloStor is the preferred vendor to over 200 companies throughout North America. We selected FloStor because of their reputation for engineering and project management. It is an advantage for us to work with a single source for our equipment and software integration. FloStor was flexible and accommodating during the development of the software interface. They handled any changes and without additional costs. 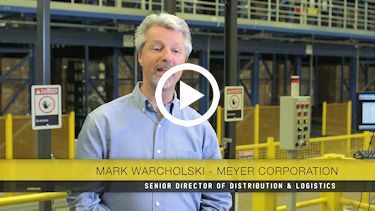 You were instrumental in designing and implementing all of our warehouse automation projects. You brought a level of professionalism and skill that we sorely lacked and you helped us through very challenging times. We're now seeing throughput levels that are 30 to 35 percent greater than what we had before the system was installed. Since the system was installed we have never been late to the assembly floor. Not once. We are now moving boxes consistently at a rate of 13 per minute, and our daily capacity has increased from $1M to $5M. The system was implemented on time, on budget without one hitch. A lot of credit goes to John Fisher of FloStor who helped us design and implement the system. The people at FloStor are really good problem solvers, and were key for us having a successful model launch. FloStor continues to make modifications until the system works the way we need it to under actual conditions. I would definitely give FloStor a lot of credit for sticking with it, and for a level of communication above and beyond what most companies would consider normal. I would sum them up as creative, flexible. And persistent. The entire team was very open, which helped immensely. We could not meet our same day roast-and-ship standards without the small parcel shipping system. One of the things we are most proud of is the fact that this whole project was complete in less than six months, and we did it without production ever missing a beat. The control system is both state-of-the-art and completely reliable. After a lengthy selection process, our Engineering Group selected FloStor based on their design concept and their ability to do the job. FloStor exceeded our expectations. Customer complaints about mis-shipments have dropped dramatically since the system was installed. Keep up on evolving material handling technology. Enter your e-mail and subscribe to our newsletter. FloStor Engineering © . All Rights Reserved.